The CIA has joined Twitter (for real this time) and, in true Twitter fashion, its online persona is already more popular than its real life self. (Within an hour of posting its first tweet, the Central Intelligence Agency had more than 66,000 followers. Way to keep it covert, guys!) Also, spy central seems to have a sense of humor. 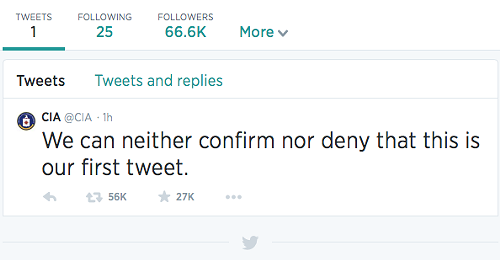 Its first message: “We can neither confirm no deny this is our first tweet.” Will future posts be as pithy? Only time will tell. Spy on the spies here. There was another school shooting yesterday afternoon, this time in Washington, at Seattle Pacific University, a private Christian school. One student is dead, two others are injured and the shooter is in custody. Suspect Aaron Ybarra, 26, was apparently subdued by Jon Meis, a student who pepper sprayed and then tackled him while Ybarra was reloading. Officials say that Meis likely saved many lives. On a lighter note, season two of the highly addictive Netflix original series “Orange is the New Black,” is out today. Because the entire season is being released at once, many of you may be planning to binge watch the entire thing. Just be careful, apparently “sleep procrastination” (AKA “just one more episode”) is really bad for your health. It looks like the Today Show is taking a page from Maury’s playbook with its upcoming feature where women surprise the father of their unborn child with the news of their pregnancy, live on national TV! This is SUCH a good idea, we can’t believe no one thought of it before. Oh, wait.